Lists can bring focus, meaning, and order to the chaos of life (well, that’s what they say HERE), so here’s some life focus for you with a magical tour of the world’s flags. Something you probably never knew how much you needed. For those who like to explore the world by doing little more than moving your finger across your phone or tablet screen, free/cheap apps like ‘Flags and Capitals‘ can help your venturing. The obsessive-vulnerable types might find themselves accidentally learning many of the flags of the world relatively quickly. This definitive flag category list will help your enlightenment in this compelling topic. Generally these are country flags — sometimes from very small or possibly uninhabited countries — with a few exceptions (like a Canadian territory or province) thrown in here and there. Like a good comic book, this is mostly pictures with a few words to keep the story rolling. Some flags show up in multiple categories, and there is a category for everyone in here so go find some that work for you. Over 90% (at least 220) of the world’s flags made it into one of these categories; fewer than twenty failed to make any list. Browse through for your favorites. The quirkier categories tend to show up near the end. Click / Tap on any flag for a larger view. By the way, most flags use a 2:3 (Height:Width) aspect ratio, several use 1:2, there are a few other variations. * You can spot most of those if you look carefully; the flags are all shown with the same width here (so the displayed height varies). Let’s keep it simple to start — the basic two-color that’s all rectangles. There are quite a number of other countries who like to keep low color inventories for their flags, sticking to just two (often including white). Several flags use this scheme; a number of other countries use the 3-stripe as a base and add detail (like a coat of arms), usually in the middle. Note that several countries / islands use the French tri-color flag, as discussed later. Just one entry, and this ends the horizontal / vertical stripe lists. United Arab Emirates has four stripes but one is vertical; Central African Republic has four horizontal stripes but also a vertical stripe and a star. Note how this group of 11 neighboring countries in Africa use a similar set of red/green/yellow (and occasionally a little black or white) colors. There must have been a regional price special on these colors at flag-creating time. 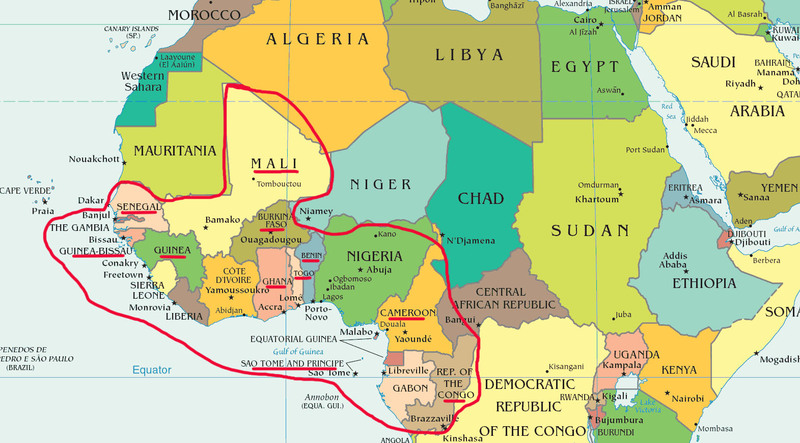 Wandering a little further from this group of counties brings some color variation in other African countries. Monaco (1881) and Indonesia (1945) have both staked out the creatively designed red-and-white flag. Similarly, both Chad and Romania went for the blue-yellow-red approach (although the blues are slightly different tones). Curiously, In 2007 Romania sent a small number of troops as part of an EU peace-keeping force to Chad; the flag similarity could lead to some interesting troop confusion. Chad adopted its flag in 1959, and Romania about 100 years before that although the Romanian one went through variations over time and had a coat of arms when Chad adopted theirs. …but in some cases they still live right next door. Like the African nations and their green-yellow-red theme, these South American neighbors went for yellow-blue-red. Red, White, Blue, maybe some stripes and at least one star? Seems like an American wannabe to the Americans. Cuba’s blue stripes just don’t seem to fit. The US Virgin Islands don’t have the right color scheme, but it speaks Americanese. The Antilles group in the Caribbean may have dissolved a few years ago, but we’ll take it. Costa Rica and Thailand lack a star to get into the group. Only Nepal manages to sport a non-rectangular flag with this double-triangular shape. Good for them; future flags should consider entering this category. It’s also the only flag that’s taller than it is wide; the Swiss and Vatican City flags are square. The official Belgium flag is almost as tall as it is wide (13:15 ratio), but often uses the more common 2:3 ratio. This one involved some judgment calls; several flags have circle features that didn’t make the cut: Burundi, Cook Islands, Ethiopia, S. Korea, Niger, Portugal. Brazil might be a little too gaudy for this group, but it was selected. … which would be hard to see. This one includes the Canadian territory of Nunavut, which the selection committee couldn’t resist. This list is fairly short and includes an unofficial flag, for a continent. This group does not include flags with an ‘X’ that make triangles on both sides, like Jamaica, Scotland, Burundi, or the dual-triangular Nepal. The American Samoa flag has a triangle from the right side. The Ecuador flag sends mixed messages, if you look closely at the coat of arms. Vacation with a touch of caution. The following places use the French flag: French Guiana, Martinique, Mayotte, New Caledonia (one of two official flags), Saint Pierre and Miquelon, Reunion, and Wallis and Futuna Islands (which has an unofficial flag that tucks the French tri-color into the upper left corner). French Polynesia has the name but the flag doesn’t look particularly French. The French Southern Territories, or French Southern and Antarctic Lands, hosts a non-permanent population of maybe 100 people and has the flag shown. Saint Pierre and Miquelon has an unofficial flag that’s much more lively. This category is for flags with a single diagonal, which may contain an outline. Among these, note that the two Congo flags are not centered on the corners like the others are. This category requires some careful judgment, since there are several flags with 5 or more colors. The criteria is 5 sizable bands or splotches of different colors. Should South Africa, with its 4 major color and two thin-lined colors, be in this category? Should South Sudan be out? It takes years of training to make those calls. The non-nation EU flag snuck into this group. This doesn’t include simple circles; it has be be more pointy since we all know the sun is pointy. Marshall Islands is left out because some think that sun-like thing is something else (see below, near “Bomb”). 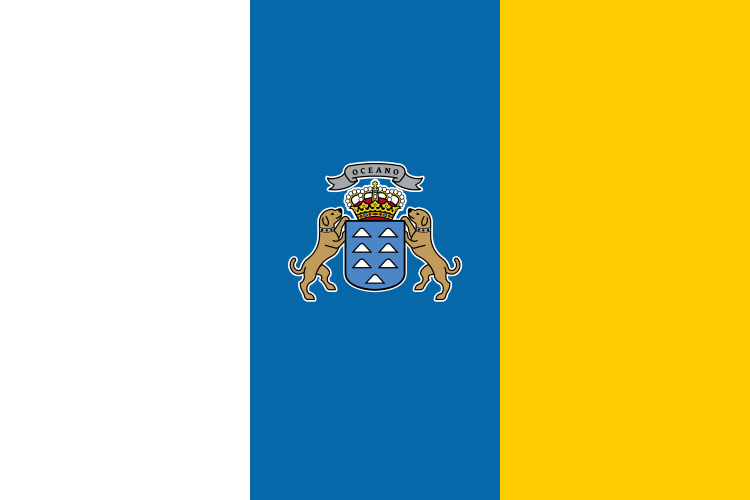 You may have to look closely to see San Marino’s three towers, or the seven castles in the Portugal flag. The Northern Mariana Islands flag contains a building’s building-block, namely the Latte Stone used as a pillar. The crescent moon, often with one or more stars, sometimes signifies something to do with the Ottoman empire (Turkey), Islam, or a few other things. … which may include dragons. 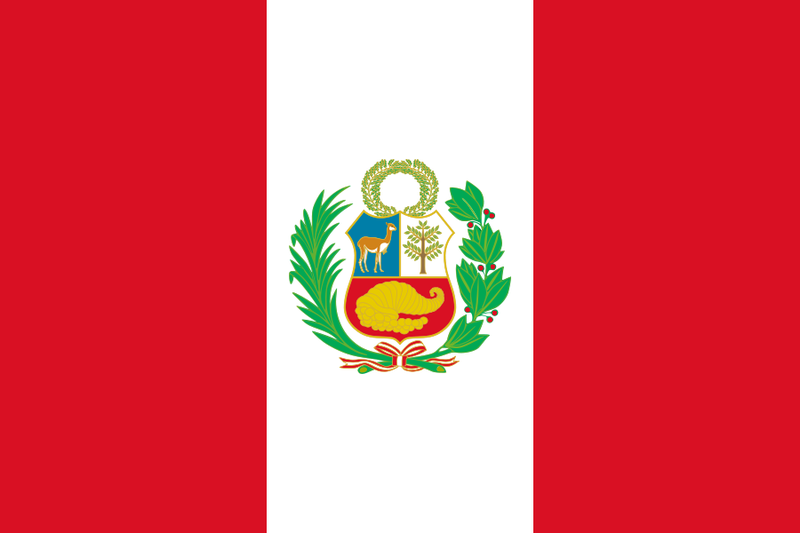 In addition to several variations of birds (eagle, crane, dove, parrot, frigatebird, quetzal, bird of paradise, plover, golden bosun, condor), the flag animals include: cow, dolphin, lion, lobster, turtle, sheep, seal, penguin, alpaca (using Bolivia’s state flag), the related vicuña (from Peru’s state flag), aurochs (Moldova), leopard (heads), goat, pine marten (those last 3 in Croatia’s) and reindeer. Canada’s Yukon would add a dog (so does Spain’s Canary Islands), and Manitoba would add a bison to the list. 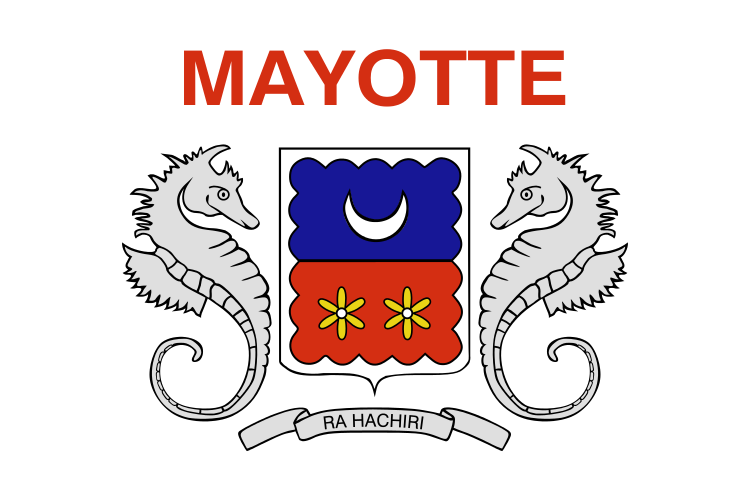 Martinique uses the French flag but has a local flag with snakes; Mayotte also uses the French flag and its local flag features seahorses – everyone’s favorite mascot. New Caledonia has two official flags (a rarity); one is the French flag and the other is shown here. That black thing in the yellow (sun) circle makes me think of an ant, although it’s supposed to be some type of arrow. This category requires more than just leg parts, so the Isle of Man does not qualify. This selective category does not include flags that just include animals or trees; it loosely focuses more on hand-held foods. There are not a lot of candidates so flags from the non-nation Association of Southeast Asian Nations (ASEAN) and the unofficial Guadeloupe one (officially the France flag) are allowed, featuring paddy/rice stalks and sugar cane respectivley. But Fiji gobbles up the category, with a sugar cane, cocoa pod, coconut (and tree) and bananas. Go there to eat! There are two such flags — which can make one pause when faced with the question, “What is the only national flag that has the bible within its flag?” Those thinking it’s the Dominican Republic obviously don’t think Pitcairn Islands deserve to have a “national” flag. Containing descendents from the Mutiny on the Bounty episode, the island(s) hosts a population that sometimes exceeds 50. It’s currently last in population on THIS list, and is referred to as “the least populous national jurisdiction in the world,” and is the world’s smallest democracy. One country vacuums up the awards in this category, with 5 carpet designs (“guls“) on its flag. … although I have to admit I thought it was some kind of iron-work until I read up on it. Of course, it’s a hat designed after a mountain. And they share a border in Africa. They’re even close in population (around 14 million) so that they currently rank #71 and #72 on this country population list. In addition to the Yin-Yang symbol in the middle, the South Korean flag contains four “trigams“, each having three lines that can be either unbroken or broken in half. These operate like binary numbers used in computers. 3 lines that can be either broken or unbroken (like 0 or 1 in computing) can make 8 combinations. For historical / philosophical reasons, the flag selects 4 of these combinations (1, 3, 6, and 8 in a 1-to-8 sequence) with various meanings. This is a very short category because there are currently no countries with just one color. Libya had a solid green flag from 1977-2011, selected by Gaddafi. After his passing, the country reverted to the flag otherwise used since 1951. Don’t be surprised if more changes are in store for that flag in the near future. … with missile strike path and a nuclear-like cloud at the impact site (use your imagination!). And coincidentally that’s what happened in the 1940’s and 1950’s in parts of the Marshall Islands (especially the Bikini Atoll). I like the colors and layout of Seychelles, the perpetually circling Isle of Man’s legs, and the informality of Kiribati (not to mention its playful name and the fact that it’s the only 4-hemisphere country). How about yours? Leave a note with your vote. Spot what you think is a mistake? Won’t be surprised; let us know that too.